While significant growth—on the order of 15 to 45 percent per year since 2009—at contract manufacturer D & H industries, Oconomowoc, WI, has certainly been welcomed news, such rapid expansion has created renewed focus on managing capacity and maintaining a high rate of on-time shipments. That’s been a tall order, as the firm has taken on more than 300 new part numbers and added 60,000 sq. ft. of new manufacturing space. For manufacturing engineering manager Jim Meyers, handling the influx of new customers and parts has meant managing the introduction of 14 additional press lines. At the same time, he also had to examine the plant’s existing pressroom equipment to identify and mitigate risk factors that could threaten to shut down key stamping assets. Metal stampings are produced on 33 presses—45 to 2000 tons—at D & H, from a variety of materials including cold-rolled and stainless steel, draw-quality steel, and nonferrous alloys such as brass and aluminum. Customers abound throughout several industries including agriculture, commercial seating, construction and electronics. And, the firm is a leading supplier of magazines for domestic law-enforcement and military service. When Meyers sought to uncover any technology-based risks to maintaining reliable, dependable service to the firm’s growing customer base, his investigation led him directly to the pressroom’s older press controls. To the point: Many of the controls were no longer being supported by the original manufacturers. Meyers assembled a team to attack the problem by identifying the presses running with obsolete controls, and developing a plan to upgrade the controls on a need basis. They immediately deemed five presses as “extremely critical to on-time delivery of product,” and these were slated for immediate upgrades. The team then developed an upgrade schedule for the remaining presses with unsupported controls. 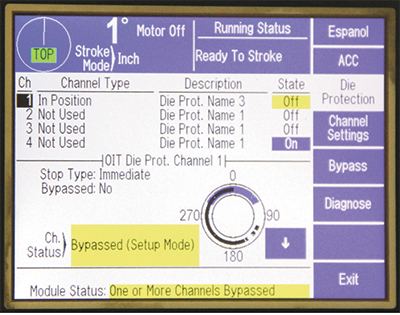 Even controls equipped with fewer die-protection inputs include valuable features. For example, the circular press-stroke chart shown here illustrates, in blue, where in the stroke the sensor needs to transition; the black shading shows in real time the actual points in the last stroke where the sensor switched on and off. This type of interface makes it easy for operators to see what is happening, and to properly program the unit. “Engineering, production and maintenance created a list of the control specifications we wanted, and then began investigating vendors to see what best met our needs,” says Meyers. Among the needs to be addressed: a new die-sensor program being implemented, which topped the wish list for the new controls. “The new controls needed to be ready to support our in-die sensing program, and provide technology that would help us maintain low overhead, consistent part quality and on-time delivery,” stresses Meyers. D & H wanted every new control to have die-sensing inputs, programmable-limit-switch (PLS) outputs and tonnage monitoring available. Many of its old press controls did not have any integrated process controls at all, which limited the firm’s ability to implement electronics to prevent crashes, reduce setup times and improve part quality. Additionally, Meyers and his team sought controls that could be easily understood on the shop floor, and that were scalable as needs change. Having sensors, PLS and tonnage settings stored as part of a job recipe was a must for the new controls. For its busiest straightside lines, D & H also wanted the ability to add setup-reduction features, such as automatic shut height, as part of job recipes. Meyers estimated that the ability to store programs and recall previously prepared setups would shave 10 min. per setup. Meyers also knew that new controls meant the opportunity to take advantage of self-diagnostic capabilities. “Greatly improved diagnostics were considered a ‘must-have’ feature for any new control coming into the plant,” he says. With the plant’s older controls, any press downtime events would require the attention of an experienced electrician. And with the addition of 14 new presses, possible production delays caused by prolonged troubleshooting missions were not acceptable. 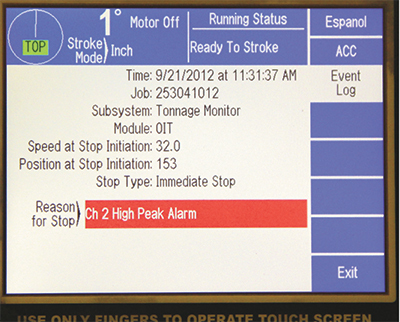 Control diagnostics provide detailed information describing every press stoppage. Shown here is a stoppage triggered by the tonnage monitor. Note that the operator also can see the press stroke rate when the press stopped, and exactly when the fault occurred. D & H now has purchased and installed new controls (from Link Systems, Nashville, TN) on the five critical presses it had identified early in the process. Smaller presses received controls with less process-control capabilities, and the straightsides received controls with more capacity for die protection and automation, such as automatic shut height. Being able to select the level of process control helped match capacity to need, and contain costs. “All of the new controls at D & H offer strong diagnostic features,” says Meyers, “with fault histories. And, the user interface maintains a similar structure in the higher-capacity and the simpler versions, so operators can switch from simple to complex press lines without confusion,” he adds. With the ability to use sensors on more tools, D & H has been able to run more jobs unattended without risk of schedule-shattering die crashes. Tonnage monitors have helped reduce setup times, and the firm is relying on the monitors to stop presses when a tonnage change indicates a variation in the process, such as dulling of the tools and changes in material thickness. Also, the new controls are managing PLSs to control feed timing, air blowoffs and other events. 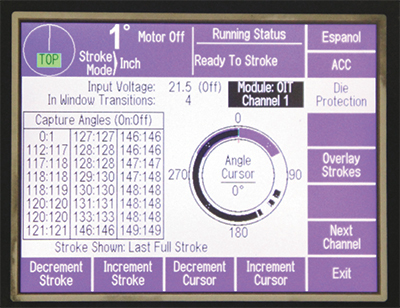 The new controls store in memory the points in the stroke where a die sensor turns on and off, over consecutive strokes. When setting up the sensors, this allows an operator to identify the best place to set the on/off angles, a time-saving feature that also helps ensure proper die-protection practice. In addition to the gains in process control, the added diagnostics capabilities with the new controls often allow operators to troubleshoot and correct downtime issues themselves, sparing a call to the firm’s maintenance department. And, if issues become too complex for the operators, ”the new control diagnostics help even experienced maintenance technicians,” says Brad Wehr, head of maintenance. “The diagnostics immediately identify what is preventing a press from stroking, so that instead of spending valuable production time identifying a problem we can move immediately to a corrective action and get the press up and running.